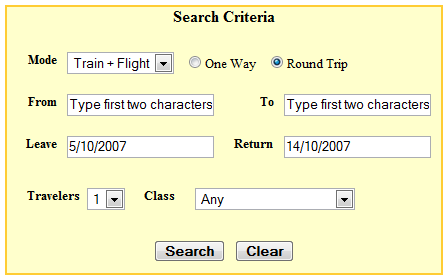 I am surprised that in this day and age we have Travel search engine looking like 90DI. I don’t know how many of you would agree with me, but I found the look of this excellent travel search engine bit too amateurish. It is also quite glaring, because even though it is ugly, it is one of the better travel search providers. I can say that as I have tried most of Indian players in this sector. I came to know about this search portal when the one of their co-founders left a comment on my analysis of Indian Airfare search comparison post. When I visited that site a month back, it had just launched and just from the looks of it I turned back without trying them out. However, today for some reason, I visited their site and tried out few searches. I was downright impressed with the search results they provided. To compare, I tried the same route from other travel search sites and 90DI was quite impressive in their results in terms of their quality as well as quantity. However, I should say here that their site is limited to search only. They give you the best routes with best prices available (combination of Train and Flight)…period. After that it takes the user to respective carrier sites where you have to do the booking yourself. This is one feature that really needs to be integrated within the 90DI site. 90DI has been developed by 3 co-founders and programmers. You can find more about them here. Maximum Places: Find the best travel routes (including flight and train availability) between 4000 places in India. Maximum Choices: Aggregates data from all the Airlines in India and the Indian Railways. Hence makes it a one stop place for your travel search irrespective of your travel mode. We try to give you maximum choices/possibilities, by combining different flights and trains. Only when one has all the choices/possibilities can one choose the “best” travel route. Mixed Mode: If your travel route involves a flight and a train route, then it gives you just that. Just mention the from and to places (no need to bother about station/airport codes) and it will show you the various route possibilities. Sort your routes on various things like fare, travel duration, departure and arrival times, number of transits. Please put some efforts in getting the look and feel of your site better. You have an excellent search aggregator, but the look of 90DI is not even from web1.0 era. Also, can you elaborate on what 90DI means and how did you come up with that name? absolutely! !even I feel the same.But there is always a scope of improvement. Thank you for the information.its a wonderful one stop site for travel information.but they really need to improve upon thier site.There is always a scope for improvement.Keep it Up!!! Seasons Greetings and Wishing you and your family a very happy new year 2008! Update from us: We have released a test drive version of the “Plan my Trip” feature. Please do have a look at it some time. Would be glad to receive any feedback on the feature. Thanks for mentioning us in your blog. Though we may not have fully agreed with the "ugly" word for the UI, but thanks any way for calling us an "excellent" engine. The UI is also much improved now. Would be curious to know what's your verdict now. Please check it out at http://www.90di.com/travel/ . On the main search page, you can also choose a color theme (out of three now – white, green and red!) to match your taste. Your further inputs on the UI are welcome. Srijaga, I am glad that you found my blog informative. This is my second visit after a month. The site is very informative. Very good and Keep Going. Yes, the site design should be improved. Hi, i have linked your blog. Btw, thanks for all the wonderful reviews and links of travel websites you have put up. In fact, its been of a great help for me when i was searching for holiday information during my forthcoming trip. Doesnt the logo look as if it has been made in wordart?? ?